I have recently added tote bags to my website and Etsy! Taking the dogs from the dog pack and moving them to brightly colored backgrounds, I hope to make them a nice accessory. I have gotten a few of the tote bags myself and am really pleased with the quality. The original works are done in acrylic on paper then scanned and put on different backgrounds. They can hold up to 44lbs and have a really great capacity at 15 inches by 15 inches. There are 54 different dog breeds up! I am hoping to add more and cats soon! I am also thinking of implementing custom options if people are interested. · Start streaming on youtube or twich? · Walk the corgis at a consistent time! There are probably way more things I could add to this list, but I think it is a good start. What do you want to get done this year? This past Friday and Saturday I participated in the Make.Sale put on by the local art space Make.Shift. This was my first experience with doing a fair of any sort and it was a new experience! This is a local and pretty small fair, I kind of knew what to expect having gone to the venue in the past, however I had never been to the make.sale before. It was the type of fair where it is a good idea to have some low priced items as most who wandered through were there for the monthly art walk. Before the fair I was really worried about how much inventory I had. I kept fluctuating on if I had enough, and decided to bring less of the more expensive items. 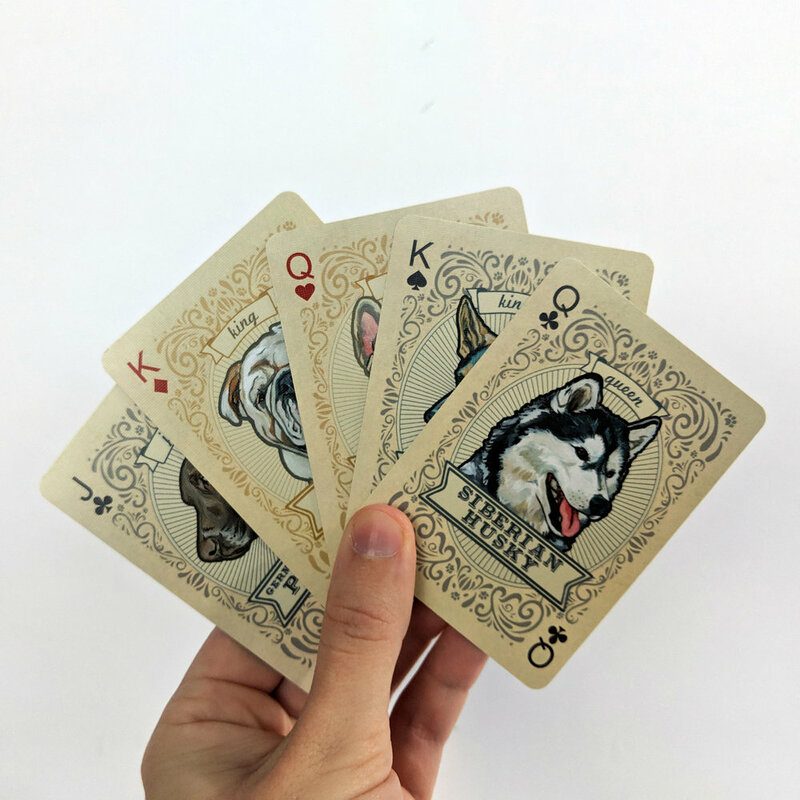 The best seller was The Dog Pack deck of cards, priced at $16. Setting up a display was fun! I was not allotted a ton of space but I tried to use both floor and table space. I think having a slightly bigger table in the future would be beneficial, I did not have much room for flat items on the table. The other thing I would do is have more labels, such as “Take a business card!”, etc. Overall I made back my fair fee, but in the future I would definitely want to market the Custom Portraits as they are what gets the most interest. Due to the closeness to Christmas I actually played this aspect down because I am already full up on commissions. I decided to use all the art that I made for The Dog Pack and make it available on pillows! Each breed of dog has five different color options, be sure to choose which you would like from the drop-down. These items are fulfilled and shipped by a 3rd party. They feature my artwork and are nice quality! “Want to add a splash of color to your home? This premium feel moisture-wicking pillow with a shape-retaining insert is just what you're looking for! It'll make any room luxurious and provide the perfect excuse for a quick power nap. I am working on making the same artwork available on Totes and more! ORDER HERE - ORDER SOON TO GET BEFORE CHRISTMAS! So I have been painting pets for over a year now, each week I get a new batch of pets and commissions to work on. Cats, dogs, birds, turtles, you name it, I have probably painted it. You think this could get old, but no, I can honestly say that I still LOVE IT! Every week it is really exciting to get a new group of pets to paint! Between working on commissions and chewy paintings, guess what, I still paint pets! Currently working on creating a collection of breeds of both cats and dogs. It is really rewarding to create and capture their personalities. I think it is because each one is different, each pet and breed has their own quirks that really add to the painting and the painting experience. I can get tired, some days I find myself spacing out and really having to motivate myself to get up and paint. However, knowing I get a new bunch of paintings to do each week really works out for the best. It really keeps things interesting. Same whenever I get a new commission I get super excited when it is time for the photos! Anyway, after a year, I still love painting pets! So send ‘em my way! 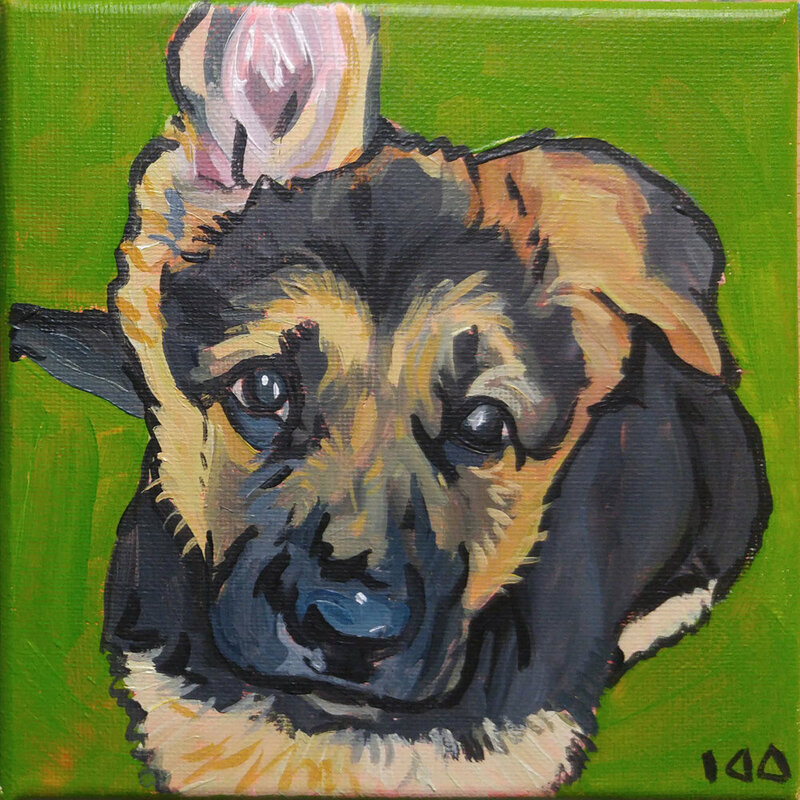 Order your pet painting for Christmas! The holiday shopping season is steadily creeping up on us! A gift of custom artwork is one that can't be beat, it is a very personal way to show someone that you care about them! I will work with you to create something that you and those you are gifting to will love for a very long time. I will be open to accepting inquiries until the end of the November for pet portraits that can be delivered before Christmas. This date may change depending on how many portraits I get to do between now and then. So be sure to check back in with me! (Also if you happen to want a huge painting I may not be able to guarantee completion before Christmas.) Start your order here. Coming sooon I will be adding some breed specific products to order on my website, such as tote bags, pillowcases and more. Check back at the end of October to see these products!